Playground games have changed a lot since I was a child. These days it feels as if children need a mass of gadgets to have fun and, mostly, they play alone and indoors. Back in the 1960’s playtime meant being outside, even if the weather wasn’t that good and mostly we needed nothing but our companions and maybe a piece of old rope. One of the favourite playground games for us girls was skipping. Whether the school provided the ropes or we brought our own I don’t remember but every little girl always seemed to have a skipping rope or we’d use a long rope with one girl at each end and a line of girls taking turns to jump. Every skipping game had a song, most of which I’ve forgotten now, along with the complicated rules. If there were no skipping ropes available there was another favourite rhyming game we played called Farmer’s in his Den. 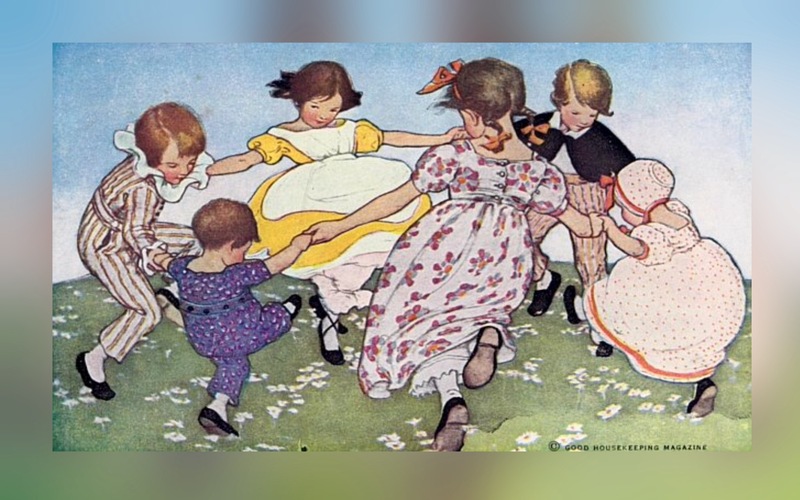 We’d all form a circle and join hands with one child in the middle of the circle and dance around as we began to sing. E I E I O – The farmer’s in his den. E I E I O – The farmer wants a wife. E I E I O – The wife wants a child. Now a child would be picked from the dancing circle and the game would go on. E I E I O – We all pat the bone. Another favourite with the girls was hopscotch. With a piece of chalk we’d mark out a hopscotch course on the playground and use a stone to throw into one of the squares. The course was a series of single and double squares and the object to hop and jump to the end without touching the lines, turn at the end and come back to pick up the stone. Modern day playgrounds all seem to have permanently marked hopscotch courses so I guess boys and girls still play the game. 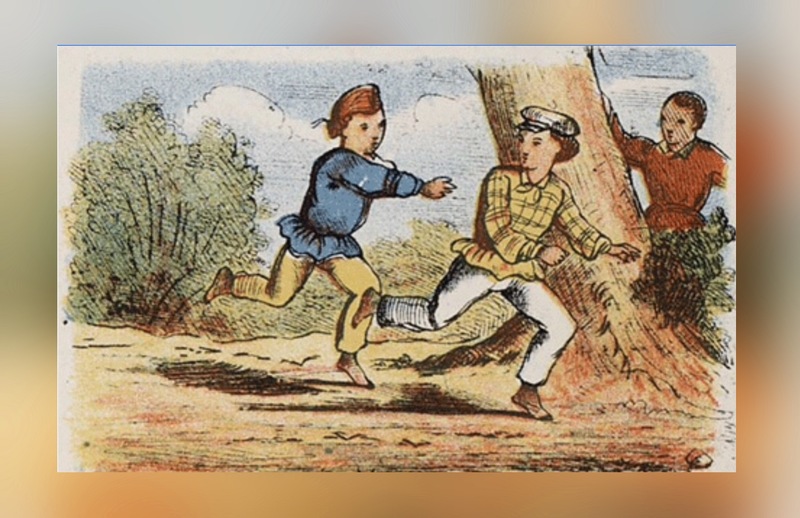 It, or tag, was a game that could involve large groups of children. Someone would be picked to be It then everyone ran around while the person who was It tried to catch them and tag them. The tagged person would them become It and the game continued. This was usually a loud, raucous game filled with screams and excitement. Occasionally someone fell over or two people collided and the game would, fizzle out. Even now though, I remember the thrill of being chased and the disappointment of being caught. Another exciting game was May I. We would all line up with one person a little way off with their back to the group being the leader. Each person in turn would have an order such as ‘take three dolly steps,” or “take three giant steps,” and that person would then move forward, but before they did they had to say “May I?” and the leader would say yes or no. The object of the game was to reach the wall and become leader but you had to be careful to remember to say “May I?” If you didn’t you’d have to go back to the beginning. In autumn conkers were the in thing. 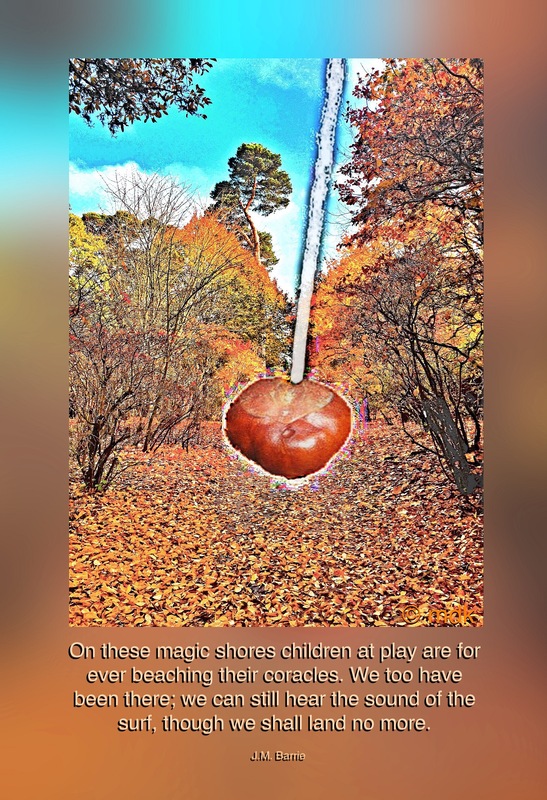 Everyone would gather the shiny brown horse chestnuts that had fallen from the trees, make a hole through them and thread a string through it. In pairs we’d take it in turns to hold our conker up while the other person hit it with theirs. The person whose conker disintegrated first lost and a champion conker was a prized possession. Boys and girls would proudly boast of a ‘threer, a fiver or even a tenner.’ Apparently, some conkers had been soaked in vinegar to make them stronger, whether this worked or not is a moot point. In the nineties, conkers were banned from playgrounds on the grounds that some children got hurt. For us though, the odd bruised knuckle was part of the fun. Most games required nothing more than a piece of rope, chalk or a conker gathered from beneath a nearby tree but there were games that needed a little more. 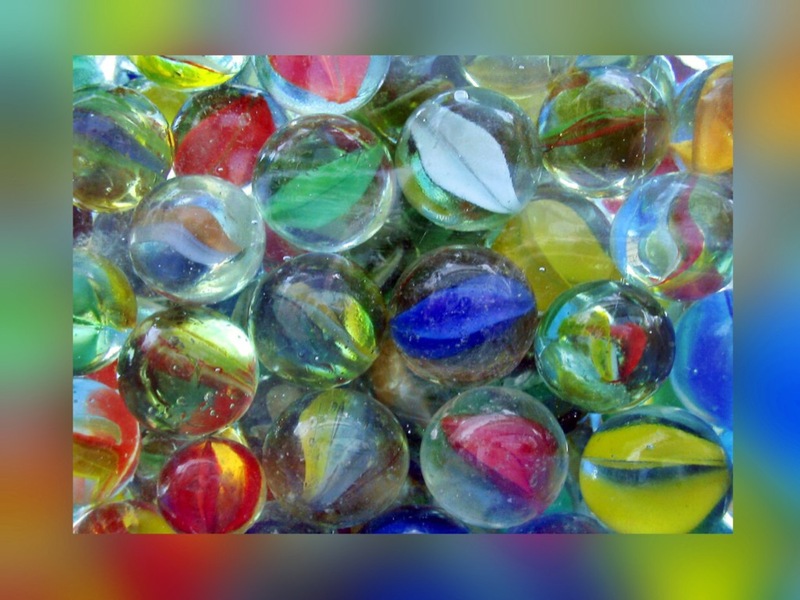 Marbles was one of these. I well remember saving my meagre pennies to buy marbles, little glass balls with bright coloured glass in the centre. In the playground the object of the game was to roll your marble at your opponent’s and hit it. If you were a sure shot you won and kept their marble. Sadly, my aim was not good and I lost more than I won so my supply of marbles needed constant replenishment. 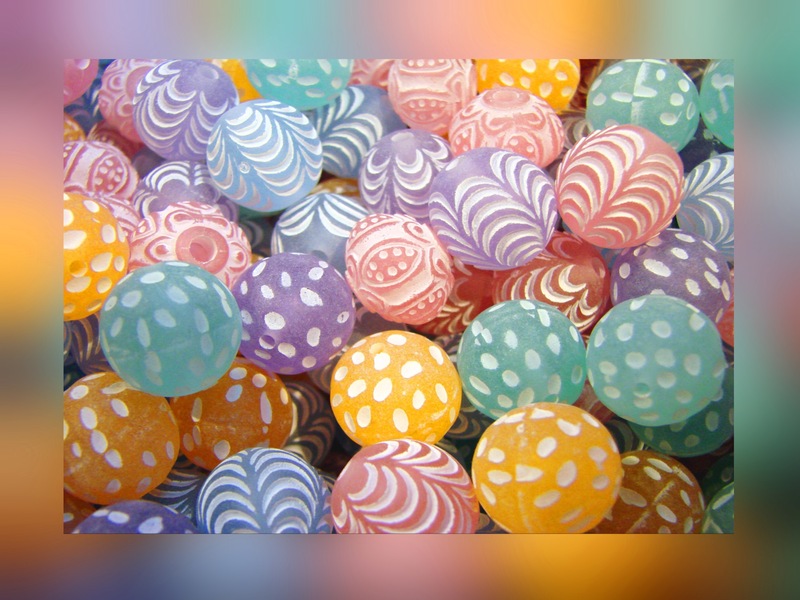 Marbles were not all created equal and some, called ‘fancies,’ had more than one colour. These were prized possessions and any game played with them involved bargaining. If you won with your ‘fancy’ you might walk away with several of your opponents marbles, then again you might lose it. Nerves of steel were required. There were also ‘biguns,’ extra large marbles and ball bearings, both of which were sought after although the ‘biguns’ were far easier to win. 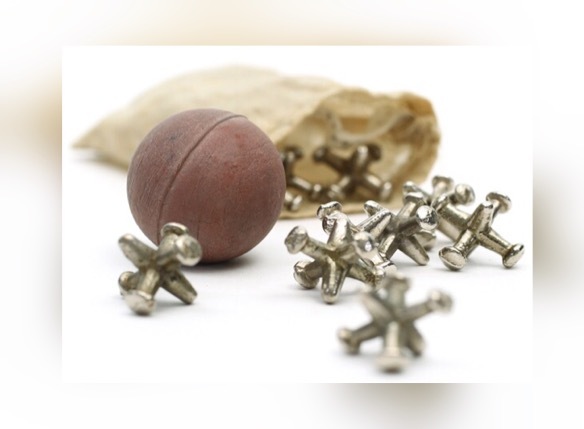 Another game that needed equipment was Jacks, dibs or Fives, although it could also be played with stones. The commercial version involved a small rubber ball and five metal stars or five little coloured cubes. The object was to bounce the ball, and pick up stars or cubes before catching the ball. This was something I was better at than marbles and the game could be played alone or with a partner with no fear of losing your jacks. Collecting things was also big back then. While the boys collected football cards girls collected beads. There were no rules but there was plenty of swapping. I remember having a large bag of beads, some from broken pieces of Mother’s jewellery, others from swapping. Diamonds were the most prized, although they were really just coloured glass. At least I’m pretty sure no one had poked any real diamonds from their mothers jewellery. The main thing about all these games was being outside in the fresh air. None of them cost more than a few pennies and a great deal of fun was had. It’s a far cry from today’s computer games or expensive toys and I think we were better for it. We were certainly healthier. I’d forgotten the worm song until your reminded me. The things we sang! I used to be good at jacks, although I do remember scraping my knuckles ’til they bled on the concrete we played on. There was another circle game which had words that started “In and out the dusty bluebells (repeat). Who will be my master?” The big ship sails has got at least two other verses, one of which involves the crew and the passengers taking tea at the bottom of the sea. I’m sure I read somewhere that it had something to do with the Suez crisis. We also had French skipping. The ends of a long strip of elastic were sewn together and two girls stood with their legs apart and the elastic at ankle height, then knee height, then hip height, then waist height. A third girl had to make complicated patterns on the elastic at various heights and widths. If it got to the point where the two girls were standing sideways on it was very hard not to catch both sides of the elastic, which meant you were out. Taller girls tended to do well, ones with big feet did not. I was tall with big feet. We played elastics too, but I think it was in the late sixties, when I was older. Being short and rather round, I was rubbish at it. I have no idea what will “never, never do” – perhaps there was a missing middle verse we had forgotten. We also had a different game for this song. We would line up in height order, near a wall, holding hands. 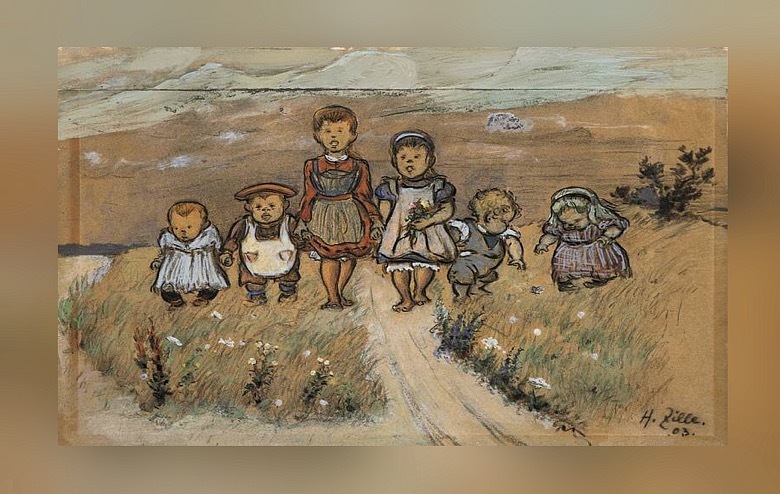 The tallest would put one hand against the wall to make an arch, then as we started singing, the littlest at the end of the line would lead the rest of the line under the arch. When the first person was well knotted up, the littlest would lead the line through the arch between the tallest and the next tallest, and so on until we were all knotted up. Then I think we all used to jump in the air and shout “hoy” or something. Since this was a village school with only a few children of each age, we were never short of people to make a pleasing line with a range of heights. And then there was the “French skipping” craze, which involved a long loop of elastic taken from our mums’ sewing boxes. It would start round the ankles of two girls standing a bit apart, and a third would jump on and across it in a series of patterns, sometimes on one foot, sometimes on both, sometimes jumping on the elastic, sometimes catching up one side of the elastic as they jumped, and pulling it over to the other side, making a sort of cat’s cradle. As each sequence was completed successfully, the elastic would get raised, first to the knees of the girls at the ends, then to the thighs, then the waists etc. If the jumper made a mistake, the turn would pass to one of the other waiting girls. As the elastic was raised, it got harder to complete the sequence successfully. I think this game was banned when the head teacher caught sight of a particularly athletic session where the girls at the ends of the loop had the elastic around their necks! 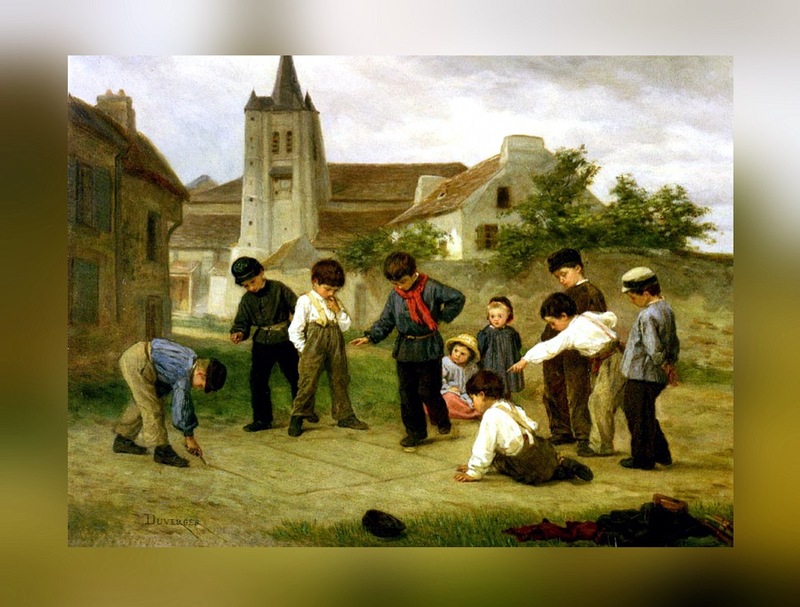 I remember most of those games: skipping rope, hopscotch, and marbles, Some we called by a different name: The Farmer in the Dell, Tiddly Winks (Jack Fives). I wrote a post some time ago about school games. Yours is far better, including the photos. 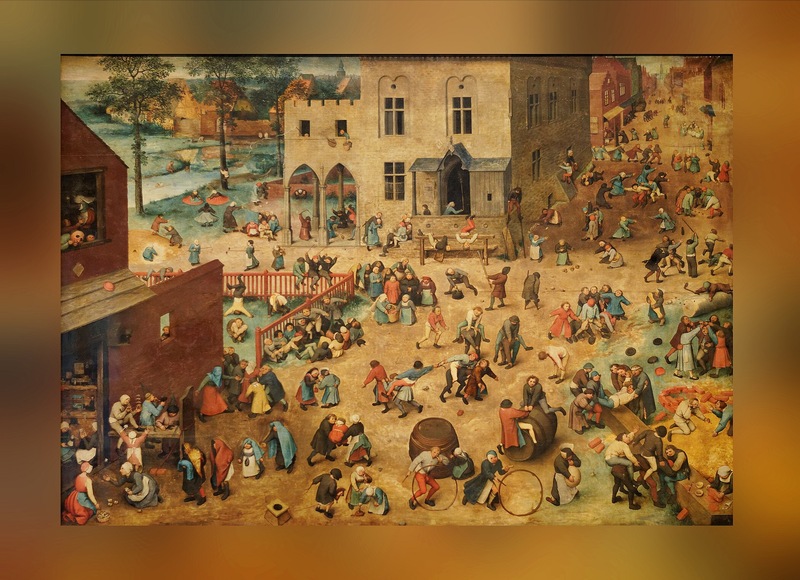 Who knew Pieter Bruegel painted “Children’s Games”? I remember jacks and tag and of course marbles, which I got fairly good at. My biggest thing was putting together model cars and airplanes but of course I couldn’t do that at school. We also played dodge ball at school, which was fun if you weren’t the smallest. I was the next to smallest.so I got hit a lot. We didn’t have dodge ball, at least not that I remember but, being a girl, maybe I just didn’t get involved in it. The boys seemed to play much rougher games than there girls. I was one of the smallest too, in fact I still am, and it had its disadvantages in some of the games we played in later years. 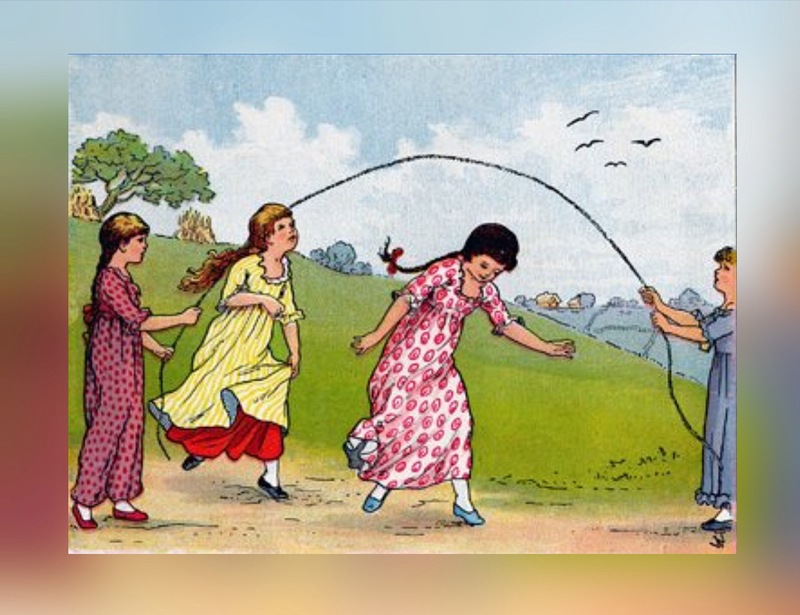 Skipping was my favourite and I’d do it for hours at home. I tried it a few years ago as an exercise and five minutes nearly killed me! I sound like a broken record, not that anyone knows what that is anymore, but we were healthier and happier. I don’t think the depression, addiction and obesity of today can be ignored. Great, wonderful memories, Marie! Thank you!! I totally agree with you. We had so much more freedom to go out and roam about and so many less reasons to stay indoors. These days play is big business with every big company trying to get in on the act and sell some new ‘must have’ toy. I’m sure we were happier with our tattered bits of skipping rope. I think we needed far more imagination then. Today it’s all computer games and social media from a very young age. I remember those clackers, must have been early 70’s, boy did they hurt. We all had bruises all the time. I’m not much for saying it was better in the old days but I do think we had less complicated, gentler childhoods in many ways. I look at my granddaughters and it seems they are grown ups before they’ve had a chance to be children.